Please click here to read our March 2019 Newsletter Number 20 (mailchimp) or scroll down below to read the website version. Plenty of variety in this one! Already a quarter of the way through this year and loads of great things to tell you since our last Newsletter. Thanks to all for your interesting enquiries, contributions, assistance, responses to queries, invitations, requests for articles and generally joining in with us. Improving thatchers’ training has been high on our agenda, along with continuing to spread the Thatch Fire Safety message. 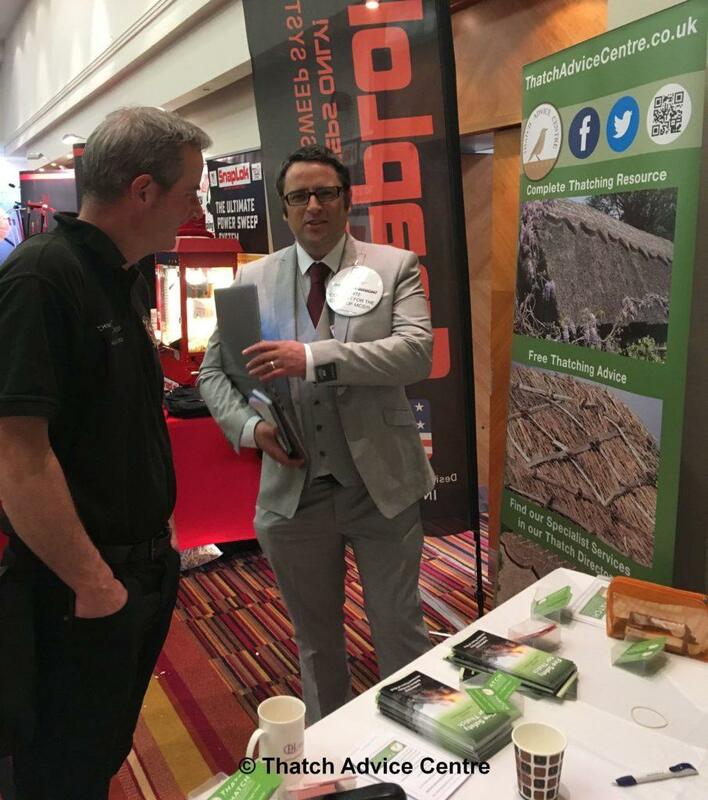 Responding to enquiries, attending exhibitions, conferences and meetings and, of course, working with our friends and associates for the benefit of thatch. It has never been so busy! 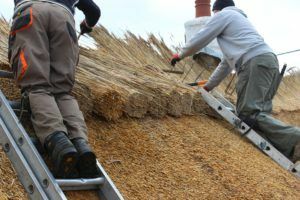 From the good stuff to the disappointing, it’s all part of what’s been going on in the thatching world. Please read on to find out more. We are keeping our New Year resolution of writing blogs/articles on our website and have also been asked to write articles for others. All this is important in helping people understand more about thatch. 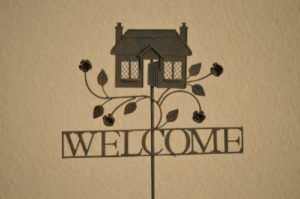 Join us on Facebook, Twitter and Pinterest for regular thatch info and topics of interest. Click on the title to show the details. Page & article additions and changes, not including our Thatch Thursday updates. Remember to tag us and share/RT as we can be more ‘social’ if you do! 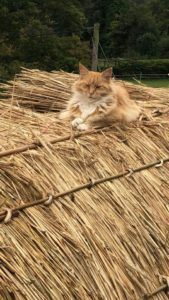 Did you notice our #ThatchThursday now includes Q&A, our Associates, and Thatch of the Month as well as some lovely thatch pictures. See below some of the varied topics we have posted about over the past 6 months. #TestitTuesday reminders and #ThatchThursdays are not listed but they do have their own Pinterest boardsThe reduce VAT on Listed Buildings Petition (with LPOC updates as they became available). The black and white challenge – pictorial fun. 12 days of Christmas posts – thatch related pictures on ridges, design features and windows. 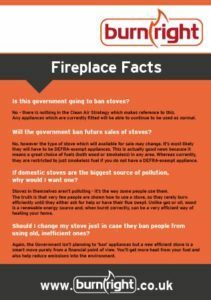 Stove thermometers – Importance of checking woodburner/multi-fuel stove is burning at optimum temperature for cleaner burning, less deposits and better heat production. 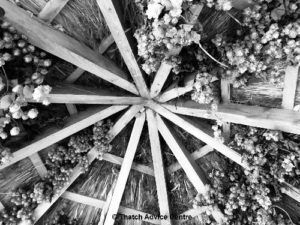 Plus plenty of interesting thatch pictures, from thatch with a peacock, flowers, gardens, dovecote, bus shelter, frosty thatch, snowy thatch, great chimneys and more. Reducing VAT – The LPOC have received a response from the Government; no change to VAT, not surprising but also not what everyone wanted to hear. They are not giving up though so… onward. Fireboard Problems – We are still being notified about problems with fireboards and damp issues. Seems to be primarily the Magnesium Oxide boards which have caused the problems on certain installations. Due to the sensitivity of these situations, this is all we can really say at this time. Our recommendation is to take care on what barriers you use under thatch, make sure they are fit for purpose and that your insurers know about it, as well as thinking about the ventilation of the building. 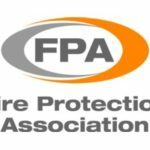 Be aware of the difference between a fire barrier and fire resisting barrier as they are often confused. Burnright – This campaign is a year old, is going very well and works well with the Clean Air Policy. Both these initiatives have messages which also benefit the Thatch Fire Safety Message. 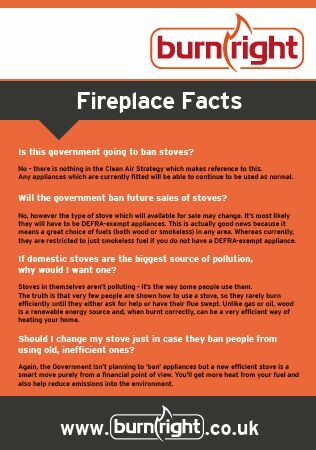 Education is so important, on what and how you burn, and we are pleased to continue to share this important and useful information. Specifications – Our helpful advice is worth a read. 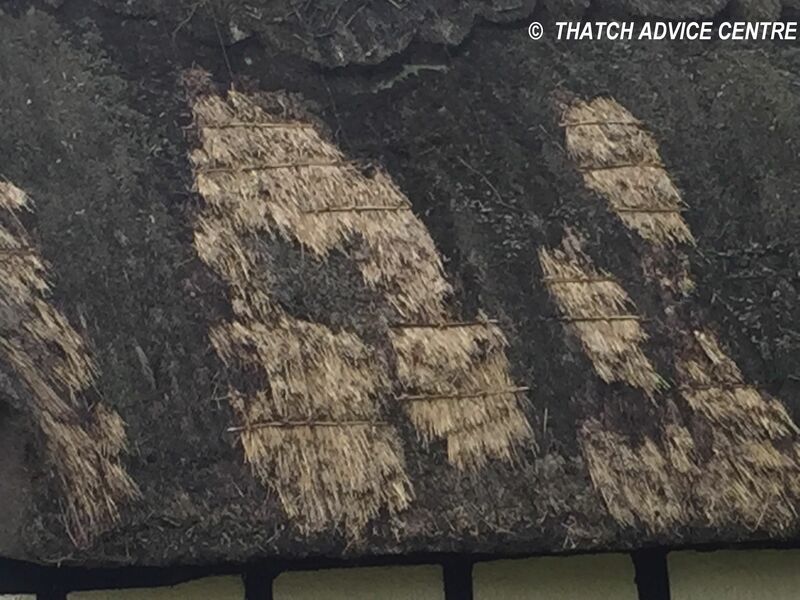 Still being contacted with problems where thatching work has been undertaken with nothing in writing from either side. This is not recommended, as all may be fine until there is a problem. 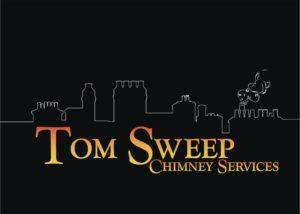 Chimney Safety Week: Disappointment – Reaction received from the NSMT with the comment: “The guide is on the website and in hard copy format. There are no plans to revise the document in the foreseeable future”. This, sadly, did not actually answer the questions raised regarding their information, despite comment on inaccuracies by Historic England. 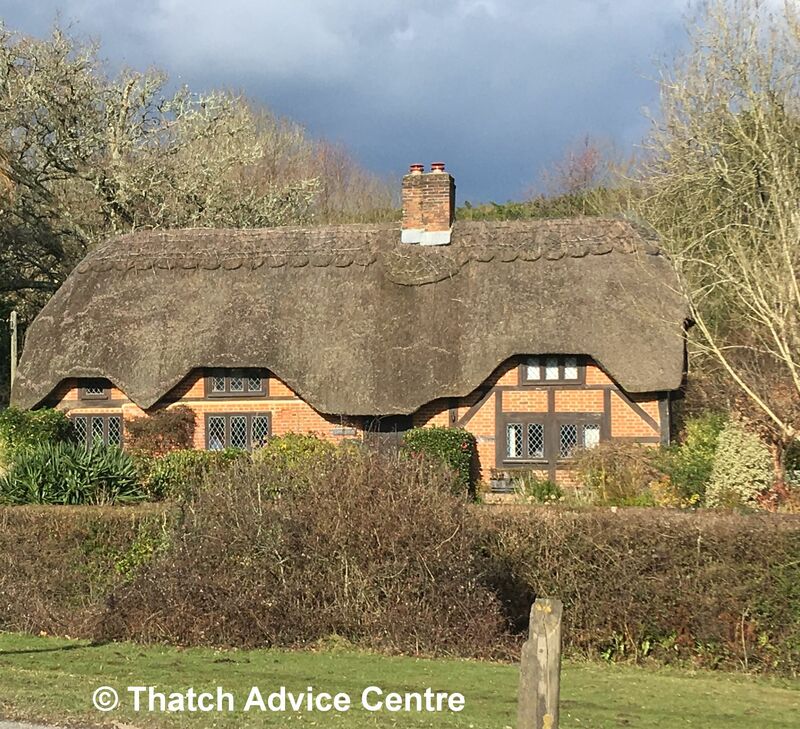 We are still hopeful that sooner rather than later, everyone can accept and promote all the up to date information to the benefit of thatched properties. The response from HETAS has been more encouraging; see below. 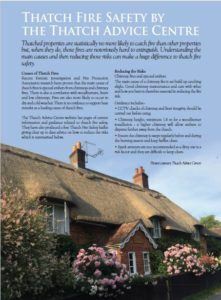 HETAS have been helpful in communicating regarding their Thatch Guidance. 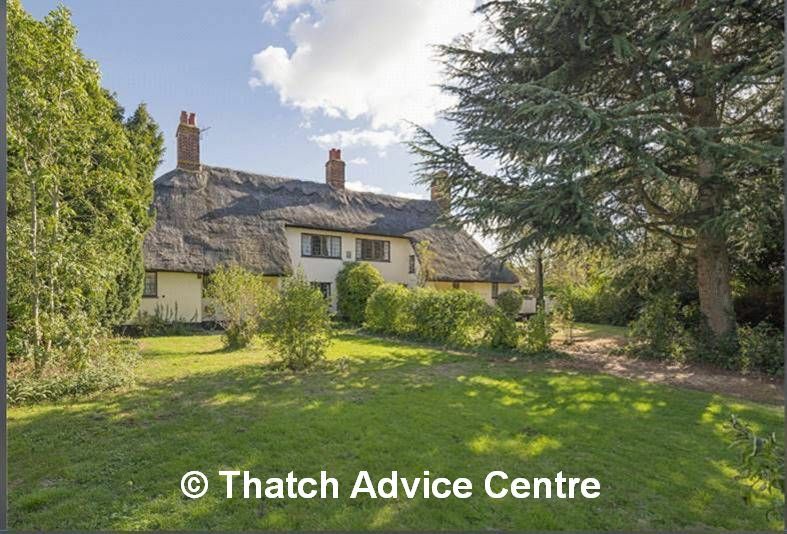 Momentum is slower than we would like but the Thatch Advice Centre, known for their tenacity and perseverance, are pleased to have received the following helpful update regarding the HETAS Thatch Guidance. Progress indeed. We await the update with interest and will obviously be informing everyone when this Guidance becomes available. It is truly hoped that it will help resolve the situations the old information had been creating and thus save us a lot of time in dealing with such queries. 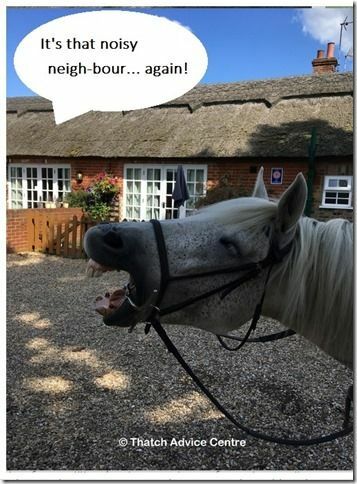 Congratulations to J Smith from Surrey for their clever caption to our competition picture. Well done; your £20 gift voucher has been sent. ……..Being sung to the tune of The Wild Rover……. Our next Caption Competition picture, Thanks to Chris Essex for this one. Entries close on Monday 2nd September at noon. Same rules apply. 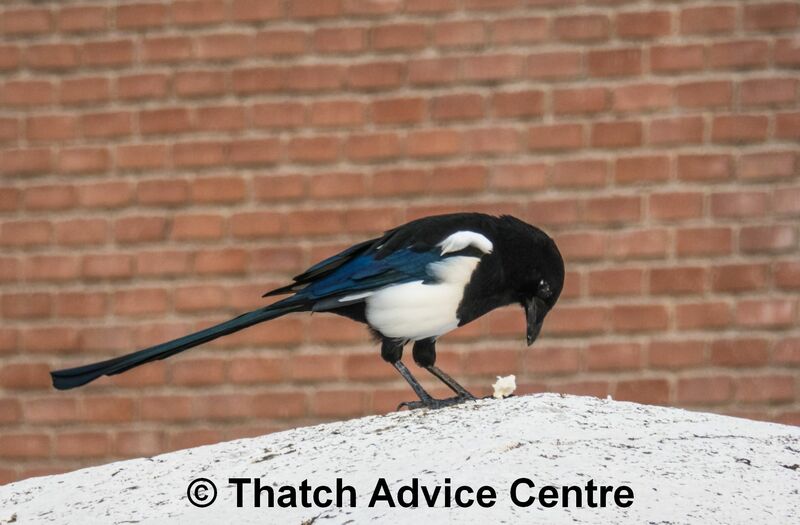 Far too many problem enquiries with pesky birds, mainly jackdaws, magpies, jays and crows. 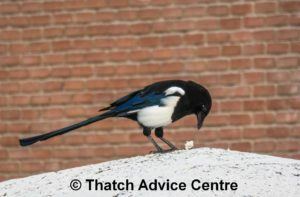 Apart from the damage they can do to thatch it is also important to stop them nesting in your chimney! With regard to damage, our advice is wide ranging. A lot of the ideas are based on experiences rather than there being a single solution for the problem. Dealing with pesky birds is, therefore, often a bit of trial and error, possibly because the birds vary in what deters them. We are not sure if birds damaging thatch is a growing problem or just that more people are contacting us about this topic. If anyone has any additional suggestions to contribute please get in touch. All help is gratefully received the more we share and work together the better. Please do not confuse bird problems with rat problems. Rats can be so very damaging to a thatched roof and must be dealt with very promptly. See our cautionary tale on rat problems below. 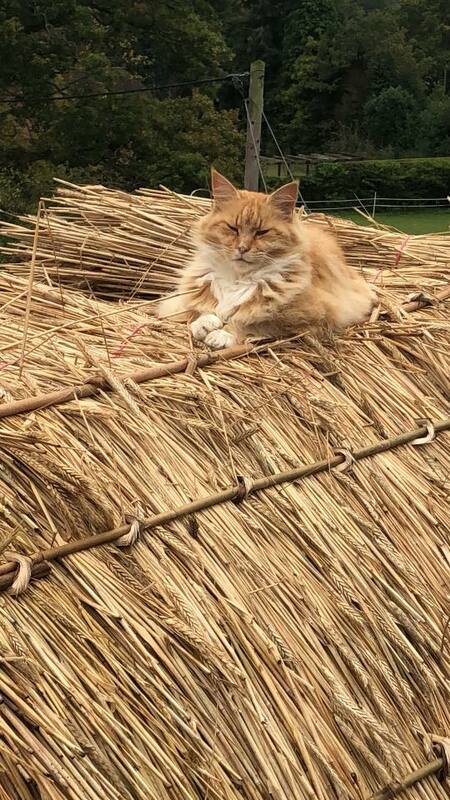 From all of our discussions with many straw farmers, reed growers, thatchers, homeowners, builders and conservation departments it appears that the common ground is that everyone wants the best material available, applied well and at a cost-effective price. It is, therefore, hard to apportion blame when roofs fail. ‘Is it even worth trying to do so?’ we have been asked. We do know that the more information we have the more we can understand what makes materials perform well. It has been suggested that climate change is affecting the longevity and that is opening an even bigger can of worms! We will be interested to hear views or anything of value you feel you can contribute. 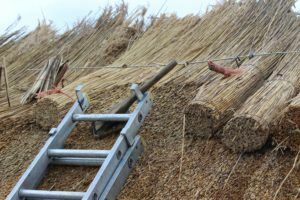 The research being done by the National Thatching Straw Growers Association(NTSGA), funded by Historic England is showing to be an interesting exercise and we look forward to sharing results with you in the future. Wonderful to again be invited to attend the Guild of Master Chimney Sweeps’ Exhibition. This year it was being held at the Q Hotel in Kenilworth, Warwickshire. This two day event (1st and 2nd March) was open to everyone. As usual, this was friendly, well organised and well attended. 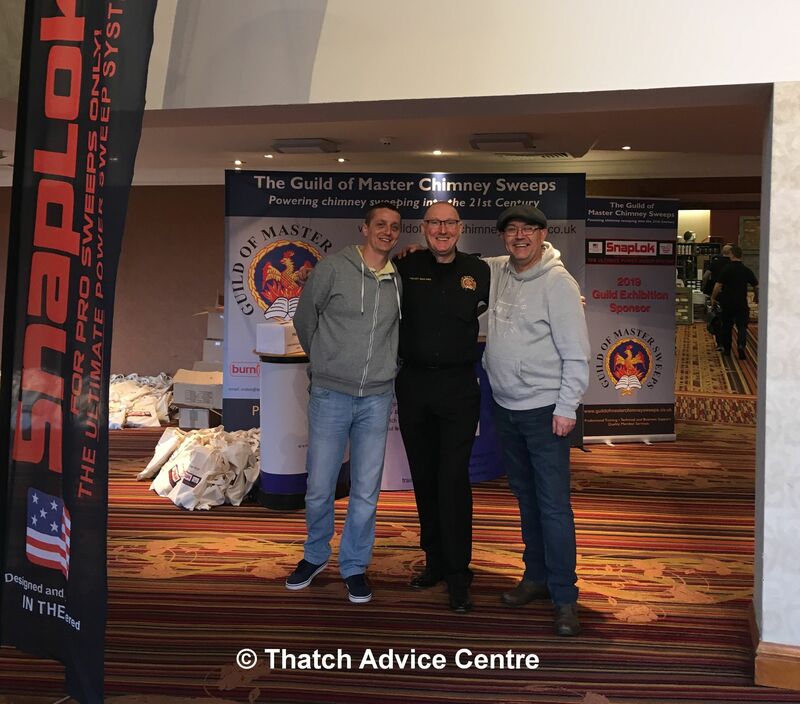 It was great to be able to share the up to date Thatch Fire Safety advice, discuss chimney safety and many other associated topics at such an interesting and informative trade exhibition. See here for our article with information on other exhibitors, speakers and events over the two days. Sadly we were unable to stay for the second night and attend the Gala Dinner. Fingers crossed for next year and thanks to everyone for making us so welcome. Sadly we cannot attend all events we are invited to and have to prioritise our time and resources. Thank you to all those who have invited us and rest assured we will stay in touch as we continue to work together for the benefit of thatch, the thatching trade and our heritage. Master Thatcher – what does it mean? How many times are we asked this question? 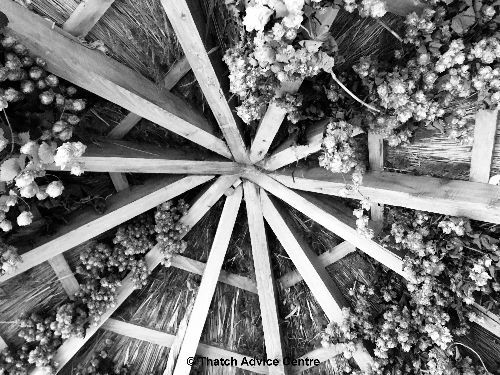 There is no overall governing body for thatching. Historically, the term Master meant someone who is experienced and/or is training someone to take on the trade (as a Master Man). Based on recent queries, we want to clarify that the term Master Thatcher is now used by any and every Thatcher who chooses to do so, there is no distinction or qualification attached. There are organisations around the country which thatchers can join (often paid membership) as well as independent thatchers. From our experience there are variables in all. 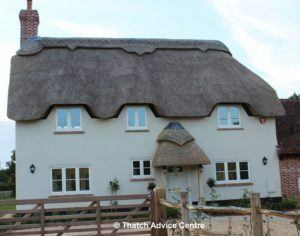 We pride ourselves that we are happy to communicate with all thatchers for the good of thatch. Please read our information on this and make an informed decision on any ‘Master Thatcher’ you employ. 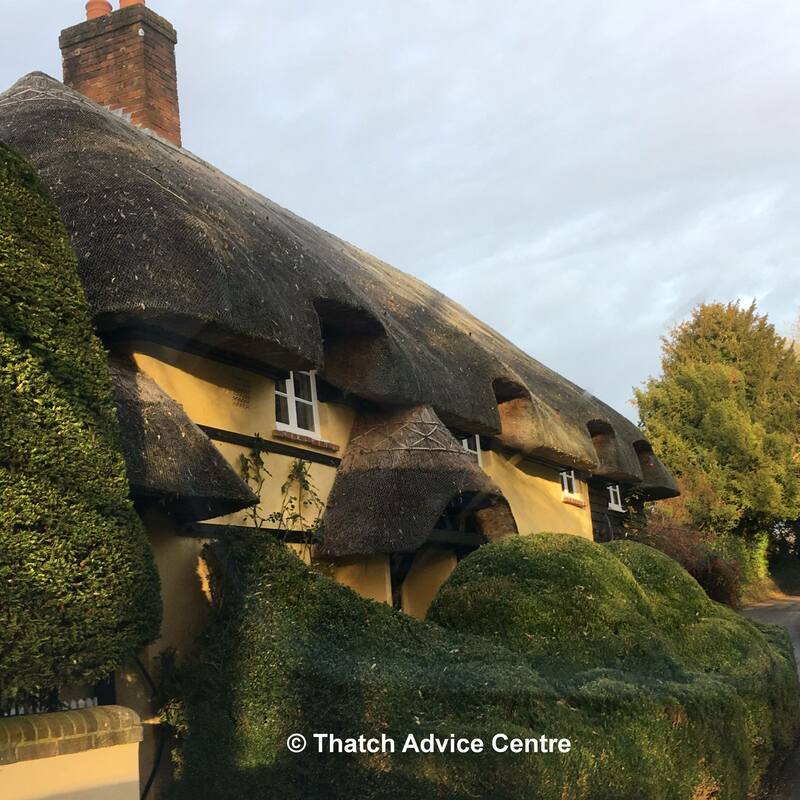 The Thatch Advice Centre are pleased to have been instrumental in the new Trailblazer Group who are working on developing the new Government Apprenticeship for Thatching. With representatives from across the country and in communication with as many thatchers as possible, it is sincerely hoped that by working together, with the trade, a funded, and inclusive to all, apprenticeship can be developed which will take the craft of thatching forward. To create a more stable future for all concerned, ensuring our listed buildings continue to be maintained and new thatch applied by those with the appropriate knowledge and skills is essential. This training needs to be relevant and sustainable and those currently involved have a lot of experience to offer. This apprenticeship is to cover all thatching works, from heritage thatch to new buildings and everything in between. For those who have been thatching for longer “An update and improvement on the days of Knuston Hall training” is how some are describing it. We will, of course, keep everyone updated of progress. Anyone wanting to be involved are welcome to get in touch (email please). From wanting to be an apprentice, already being a trainee and wanting to get a qualification, or wanting to be involved in the process in some shape or form, we would love to hear from all of you. There is still a lot to do but progress has been impressive so far. It is important to share this with all thatchers so, if you can, please help us by spreading the message to those who may not be on our emailing list. Rats are a known pest which can cause considerable damage to a thatched roof. 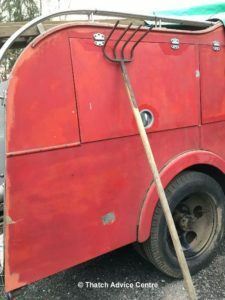 It is therefore important to be careful to reduce the chances of rats causing problems to thatch, both when it is on the roof and when it is being stored. This cautionary tale is one of care with use of rat poison. Poison was used and put down in thatching straw on a job. Sadly this poison was found and ingested by the property owner’s dog, who consequently died. No one wanted this outcome but it shows the importance of careful and appropriate positioning by competent people. In the past gin traps were used for rats but, unfortunately, they caught farm cats who would end up three legged. We’re glad that these are no longer legal. When a local pig farm closed, it was then noticed that the village was then infested with rats. It appeared that with no pig’s food to nibble on the rats moved from the farm into the village. Perhaps it is a case of where is the Pied Piper when you need him? Spreading the up to date Thatch Fire Safety message is making brilliant headway. 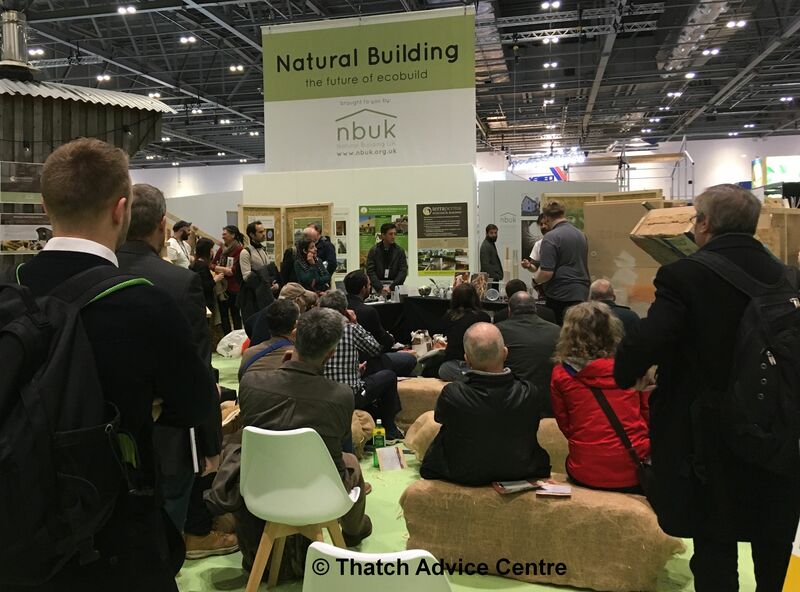 From the excellent Event at Devon and Somerset Fire and Rescue (including speakers from Historic England, NFU Mutual and the Fire Protection Association) to attending the Guild of Master Chimney Sweeps Exhibition and Futurebuild at Excel London as part of the NBUK area. Promoting the up to date Thatch Fire Safety message is always on our mind and it is building momentum. Educating people in the proven causes, up to date research and then how to understand and reduce the fire risk is our aim. It may take time for things to change and improve but it is starting to happen now which is so encouraging. Our article on thatch fire statistics is worth a read. 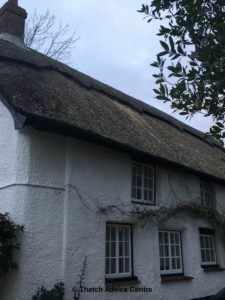 At the time of writing, so far this year (2019) there have been 10 thatched roof fires and last year there were a total of 31. These numbers although still not wanted are not as worrying as some statistics being bandied about. 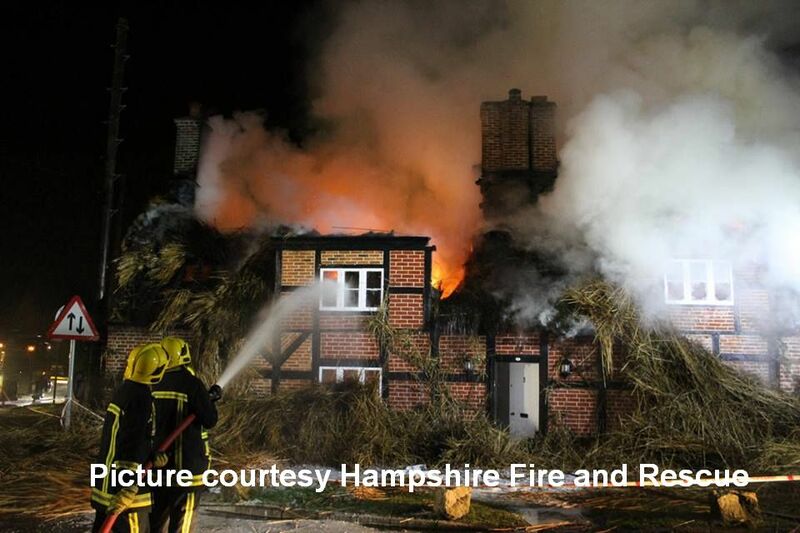 Fires in thatched properties are different to fires in thatched roofs. We have spoken to Historic England who are so helpful in this regard. Currently, the Fire Service incident recording system does not include heritage or fires of special interest (e.g. thatched roofs). Working to enhance the quality and relevance of recording of information on such fires will improve the ability to understand and advise. So, based on the current real thatched roof statistics above, please understand this is the number of thatched roof fires from 1000s of thatched properties in the country. It is believed the number to be around 100,000 but there are also no clear statistics on this. Reduce the risks but don’t worry unnecessarily based on such statistics; enjoy your lovely thatch. We will continue to notify and encourage all Fire Services to understand and act on the current up to date information and advice on causes and risk reduction for thatch fires. From Fire Safety visits to literature and websites, as with other organisations these updates can make a difference. As a large organisation where funding issues are understood, helping the Fire Services to promote the best information to homeowners so that thatch fire numbers are reduced are an important issue. 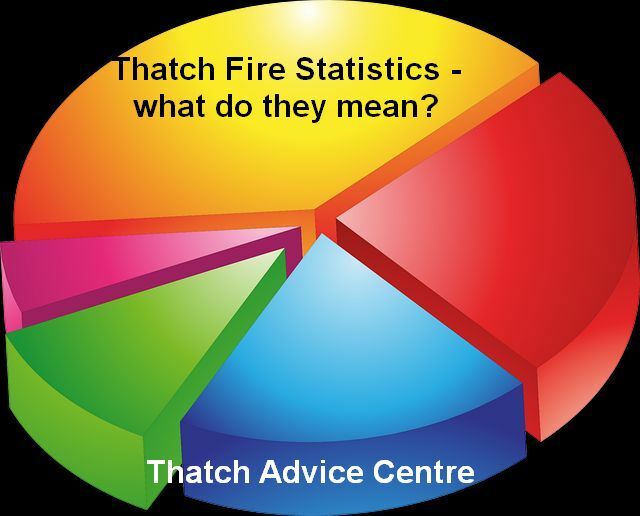 Not so much due to the number of fires but due to the amount of resources required for a thatch fire and the associated costs. Another area where social media and websites can be used very cost effectively to promote fire safety. Our #TestitTuesday social media posts are growing in popularity – a recent one reached over 10.5K! This is another way that we are #workingtogether to spread useful and helpful information for free and, in turn helping our Fire Services. Please like and share our posts to help extend the benefit, as we are not likely to pay for any promotions (unless we win the lottery!). Proud and pleased to be asked to contribute a blog for onthemarket.com. A bit more #workingtogether for the good of thatch. Rather pleased with the result and happy to be of help to anyone looking to purchase a thatched property. 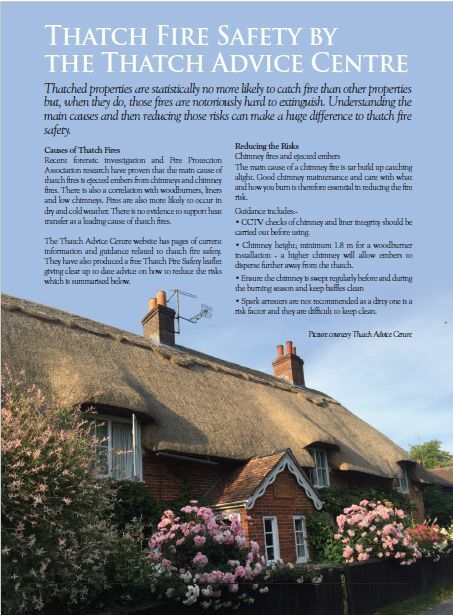 More information on buying (or selling) thatch is also available on our website. As we find #WorkingTogether an integral part of what we do, we have used this phrase for several years, especially in the important work that we do on Thatch Fire Safety. Please note, as there were some misunderstandings, we were not involved in organising the recent conference of the same name, held at Hampshire Fire and Police HQ. Good title though. Although we could not attend, it will be interesting to receive feedback on this event and share anything relevant. Social media is a great way to spread information so please Like, Love, Share and RT our posts. We have no budget for promoting posts, so all individuals’ help in doing this is gratefully received. 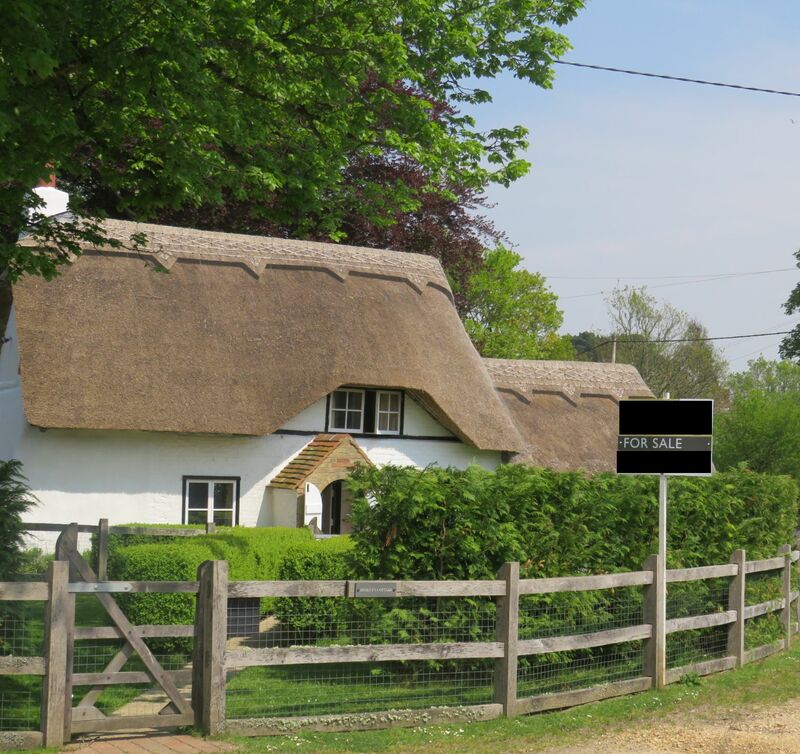 We understand very well which building regulations affect thatched propertiesand also how difficult it can be to meet those regulations for many homeowners. It is sincerely hoped that the review of Building Regulations will have benefits in improving and clarifying the position for thatched property building and maintenance works. One interesting topic for the future is which products / systems are approved, as well as their relevance and any supporting tests. We continue to gather information/evidence on this subject and are happy to discuss with those who are in paid positions to influence such improvements. It is hoped that the FPA research, current Building Control issues and our endeavours will not be ignored in any updates. 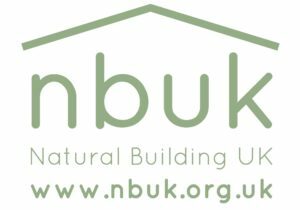 However, a recent discussion confirmed to us that it may be 10 years before any changes are implemented to Building Regulations. Until then we will continue to help people juggling those varied Building Regulation, Conservation, Fire Safety and Insurance balls. Sensible decisions have to be made based on knowledge and understanding and it is unfortunate that these balls are not always synchronised. We aim to be the sensible voice of reason explaining situations so that people can make informed decisions or plans. It is so important for everyone to have a working Smoke and/or Carbon Monoxide alarm so therefore regular testing is essential. We hope you are all aware of our regular #TestitTuesday posts on social media. Friends and associates have started to send us pictures for this campaign. This has benefits of promoting them while helping us. 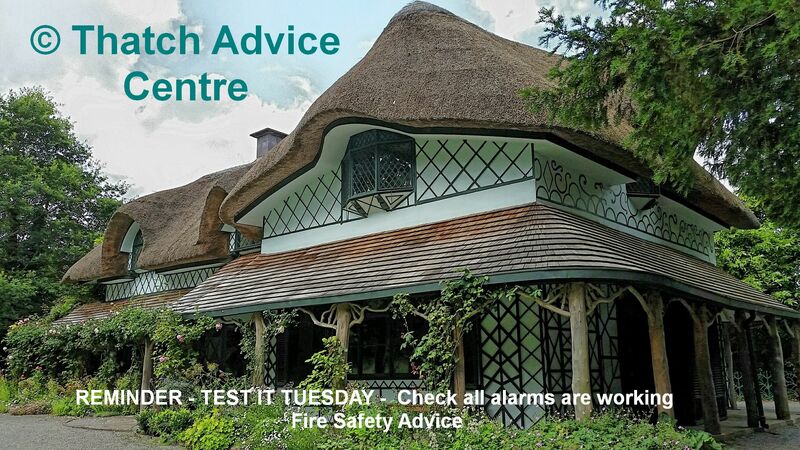 Our March #TestitTuesday post reached over 10.5K – great free advertising. 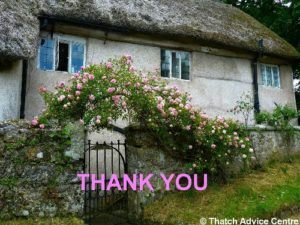 Thanks to all those who have shown interest in our Thatch Directory in the last couple of weeks. We look forward to welcoming you to our growing group of specialist Associates. As a free advice resource, sustained by volunteers and helped by associates and organisations, all of your lovely feedback is so appreciated. Here are a few recent comments made which make us feel that the effort is definitely worth it. Thank you for the kind and motivating words. 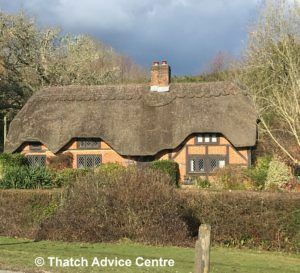 Send us some pictures of thatch which we can use for the website, social media posts etc (which, if you want, you will be credited for). Or even a great picture for a future Caption Competition. Thanks to those who has done so and in anticipation of those who will. Our site has one clear list of categories so it is easy to find help. We are always looking for proven services to join us. References are required. If you have not signed up, please join us.